Imagine you’re chopping a potato in the kitchen, but rather than throwing it into a pot of soup, you stick the slices on your face. What? Yes, you likely didn’t know that potatoes can be very beneficial for your skin. The best part about potatoes is that they’re widely available and relatively inexpensive. Just make sure you buy organic ones, as your skin will likely absorb the synthetic pesticides if you don’t, which could undermine all the wonderful uses this nightshade vegetable has for your body’s largest organ! Raw potatoes have several nutrients, trace minerals, and vitamins in them that can help your skin out. Vitamin A: Helps prevent the appearance of wrinkles. Vitamin B: Improves skin tone and reduces darkening of the skin. A deficiency in this group of vitamins can cause acne, wrinkles. and even eczema. Ah! Vitamin C: Perhaps the best vitamin for your skin, this vitamin helps repair any damage, combats free radicals and aging, and promotes healing. Calcium: Helps regulate moisture, the growth of new cells and reduces irritation. Potassium: Helps your skin to stay moisturized! 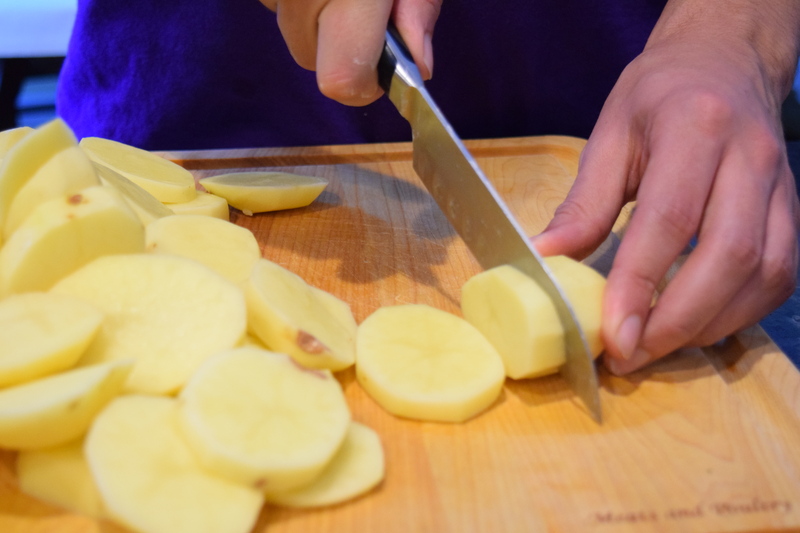 Using raw potato for your skin’s health is easy. Just remember to always use raw organic potatoes. Cooking them won’t do much good! Apply it to problem areas on your face (or your whole face), such as wrinkles ( it might be best to use the juice of the potato and apply liberally to your face and leave it there). For blemishes, juice the potato, then use the juice daily to rinse your face. For sunburn, if you don’t feel like sitting around with big slices of potato on your body, use the juice of the potato. You can cover your eyes with the pieces or place them under your eyes if you have dark circles. For sunburn, simply put the potato slices on your skin. You can apply it to your face. You may also opt to make a paste out of the potatoes and do a mask, which you can leave on for up to twenty minutes. Sit back, relax, and let the potato work its magic! The benefits of using raw potato for your skin health are numerous. 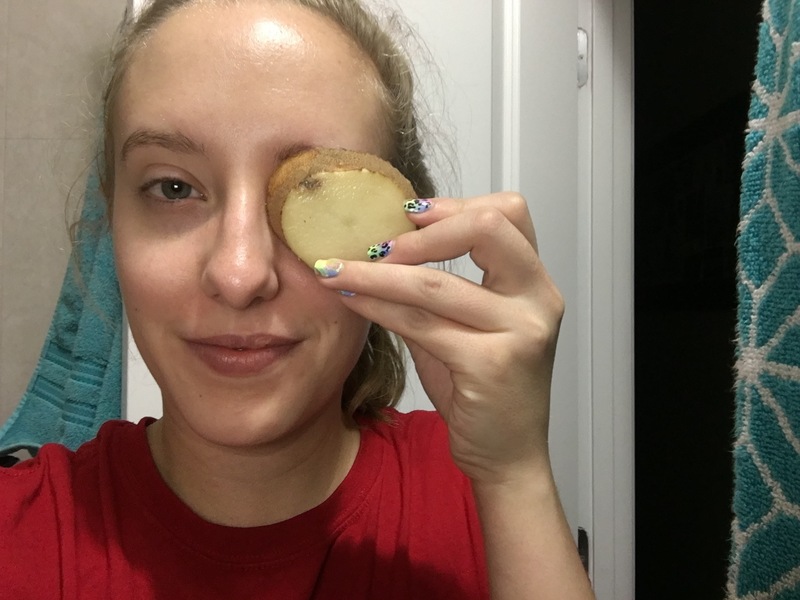 Whether you’re simply looking for brighter, more hydrated skin or if you have problem areas such as puffy eyes and wrinkles, using the potato beauty remedy can work wonders! Dark Circles: The vitamin B in potato can help reduce your dark circles. Simply put slices of potato over them and give them some time to beautify your skin! Blemishes: The high content of vitamin B and C can help soothe your blemishes and encourage healing. Wrinkles: The vitamin A in potato can help inhibit wrinkle formation and give your skin an instant pick-me-up! Soothe Sunburn: The vitamin C in potato will encourage healing, and the cool raw potato will feel lovely on your poor skin! Reduce Puffiness and Swelling: The minerals in the raw potato along with vitamin C will help reduce any puffiness and swelling on your face. Anti-Aging and Hydration: The high potassium content of potatoes helps you to stay hydrated and the vitamin C combats aging! Did you know that you can also use potato as a hair mask? By using the juice of the potato with another agent such as honey, you can protect your hair from damage, help your hair to grow faster and be more full, and even prevent hair loss. From face masks to hair masks and having even more, internal health benefits such as helping with kidney cancer, inflammation, and detoxing the body, the potato is getting its moment these days for these and many more health benefits. With the availability and price of potatoes being perfect for your beauty purposes (in addition to being less toxic, animal-tested, and expensive) than conventional beauty products, why not give the potato a second look for your skin care needs? You’ll be surprised how empowering it is to conduct your own beauty routine at home without the help from a brand-name product. Show your skin a little TLC with a potato!